Die Mercurii, 16 Maii, 1649. ORDERED, That the Lords Commissioners for the Great Seal of England be authorized and required to issue a Commission of Oyer and Terminer, under the said Great Seal, for Tryal of those Thieves, called Moss Troopers, that are taken about Carlisle, Cumberland, and Northumberland: And that the same be directed to Colonel * Wasthall, * Shafto, Esquires; and such other Gentlemen as Colonel Wasthall shall nominate. A Letter from the General, from Burford, of the Fourteenth of May 1649, was this Day read. Ordered, That the Committee of the Army, be required to give Warrant to the Treasurers at Wars, to pay, unto Captain * Bridger, the Sum of One hundred Pounds, for a Reward for his faithful Service to the Publick; and Fifty Pounds more to buy him an Horse: And the said Treasurers are required to make present Payment thereof to him accordingly. Sir Arthur Haslerigg reports the Information of Dr. Thomas Grey, and the Examination of George Clavering Gentlemen, touching Captain Batten, Governor of the Holy Island: Which were this Day read. Resolved, &c. That this House doth approve of what Sir Arthur Heslerigg hath done, in removing and discharging Captain Batten from being Governor of the Holy Island, and in placing another Governor there. Resolved, &c. That it be referred to the Lord General, to take into further Consideration the Business touching Captain Batten; and to do therein as he shall think fit. Ordered, That Sir John Hippesley be admitted to come in, as a Purchaser of Deans and Chapters Lands, for the Thirteen hundred Pounds by him lent to the Use of the State, and Interest after the Rate of Eight Pounds per Centum per Annum for the same, from the Time of the Loan thereof, at the Rate of Fifteen Years Purchase, in case he do not double, or at Twelve Years Purchase, upon Doubling, according to the Act, as he shall elect: And that the Trustees and Register Accomptants be required to admit him accordingly. 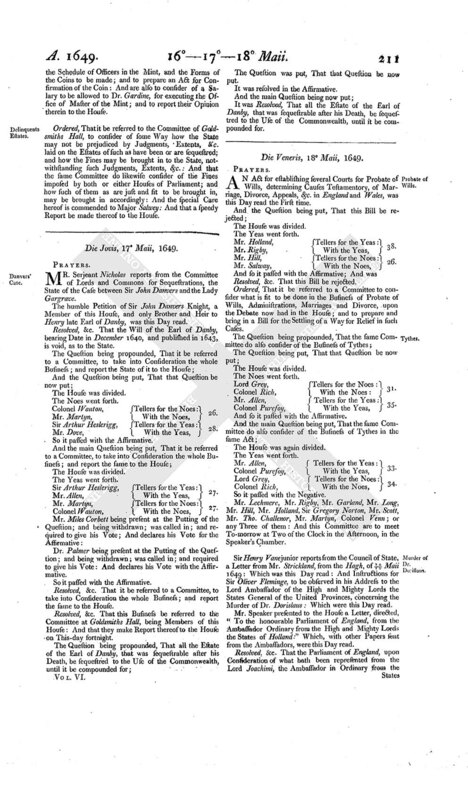 Ordered, That it be referred to the Committee of the Revenue, to take into Consideration the Business of Collectors of the several Subsidies; and how those Collectors that have paid any Monies by them collected for the Service of the Parliament, or been enforced to pay the same, or any Part thereof, to the Enemy, and have just Cause to be relieved, in Equity, or good Conscience, may be relieved; and how the Arrears may be brought in; and to advise with the Barons of the Exchequer herein; and report their Opinion to the House. Ordered, That the Amendments to the Act, touching the Fens, be reported by Mr. John Goodwyn, To-morrow, next after the Business of Sir John Danvers. Ordered, That it be referred to the Council of State, to examine the Accompts of the Treasurers and Receivers of the Garisons of Newcastle, Tinmouth, Carlisle, and Barwick; and see how the Accompts stand, touching the Four Shillings per Chaldron received at Newcastle, and other Charges upon Coals, as well imported as exported; and of other Monies allowed to those Garisons; and what Provisions and Stores are now in the said Garisons; and what is necessary for their Supplies, and Fortification of them; and to take care, and give Order, That, as soon as these Garisons may be otherwise certainly and sufficiently provided for, that the Imposition of the Four Shillings per Chaldron be taken off, for the Ease of the People. Ordered, That the Business concerning the Imposition on Salt and Grindstones, at Newcastle, be likewise referred to the Council of State, how the same may be taken off; and take Order therein, as they shall see Cause. 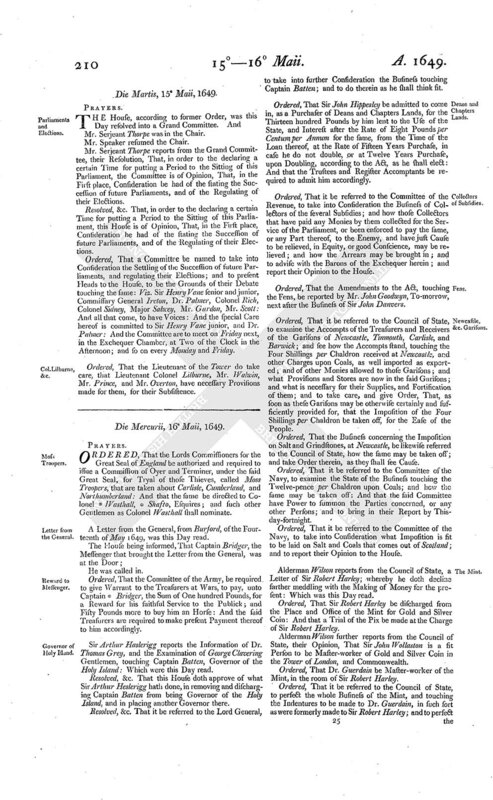 Ordered, That it be referred to the Committee of the Navy, to examine the State of the Business touching the Twelve-pence per Chaldron upon Coals; and how the same may be taken off: And that the said Committee have Power to summon the Parties concerned, or any other Persons; and to bring in their Report by This-day-fortnight. Ordered, That it be referred to the Committee of the Navy, to take into Consideration what Imposition is fit to be laid on Salt and Coals that comes out of Scotland; and to report their Opinion to the House. Alderman Wilson reports from the Council of State, a Letter of Sir Robert Harley; whereby he doth decline farther meddling with the Making of Money for the present: Which was this Day read. Ordered, That Sir Robert Harley be discharged from the Place and Office of the Mint for Gold and Silver Coin: And that a Trial of the Pix be made at the Charge of Sir Robert Harley. Alderman Wilson further reports from the Council of State, their Opinion, That Sir John Wollaston is a fit Person to be Master-worker of Gold and Silver Coin in the Tower of London, and Commonwealth. Ordered, That Dr. Guerdain be Master-worker of the Mint, in the room of Sir Robert Harley. Ordered, That it be referred to the Council of State, to perfect the whole Business of the Mint, and touching the Indentures to be made to Dr. Guerdain, in such sort as were formerly made to Sir Robert Harley; and to perfect the Schedule of Officers in the Mint, and the Forms of the Coins to be made; and to prepare an Act for Confirmation of the Coin: And are also to consider of a Salary to be allowed to Dr. Gardine, for executing the Office of Master of the Mint; and to report their Opinion therein to the House. Ordered, That it be referred to the Committee of Goldsmiths Hall, to consider of some Way how the State may not be prejudiced by Judgments, Extents, &c. laid on the Estates of such as have been or are sequestred; and how the Fines may be brought in to the State, notwithstanding such Judgments, Extents, &c.: And that the same Committee do likewise consider of the Fines imposed by both or either Houses of Parliament; and how such of them as are just and fit to be brought in, may be brought in accordingly: And the special Care hereof is commended to Major Salwey: And that a speedy Report be made thereof to the House.